A food processor adds speed, consistency and convenience to any kitchen project when the cook wants to save time and energy when chopping up foods such as vegetables. Food processors can often slice, dice and even julienne, depending on the model and blade attachments, making them handy for preparing anything from soups to homemade baby food and fresh juices to salads. 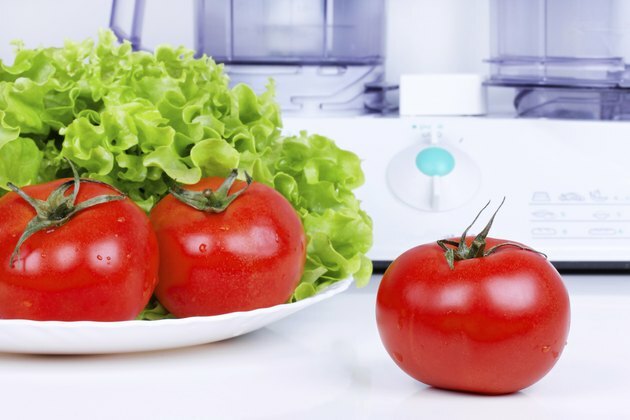 Purchase the fresh, raw vegetables that you plan to cut up in the food processor. Place all of the vegetables that you plan to food process on the kitchen counter near the sink. Wash all vegetables that require washing. Use a large bowl filled with water to wash vegetables that need to be handled gently, such as cauliflower or broccoli. Peel any vegetables that require peeling with a vegetable peeler, such as carrots. Use a paring knife to chop the ends off vegetables, such as broccoli, onions, garlic, carrots and celery. Peel any onions and garlic that you are using. Cut any bruised or unwanted parts off vegetables with a paring knife. Chop vegetables on a cutting board into smaller pieces that will fit into the food processor opening. Chunk-sized pieces that are 1 to 2 inches long are an optimum size. Plug the food processor into the electrical outlet. Place chunk-sized pieces of vegetables into the food processor opening. Depending on what you are preparing, you may need to chop each vegetable individually. If preparing a stew or soup, add your vegetables to the food processor at one time and cut them all together. Place the lid on the food processor, making sure that it is securely closed. Check your manual as needed for latching instructions. Turn the food processor to the appropriate setting, based on how finely you want to cut the vegetables. While the food processor is running, place one hand on the food processor button. Use your other hand to hold the top of the food processor closed. Turn the food processor setting off when the vegetables have chopped to desired thickness. This will depend on your food processor's power and settings and on how quickly your appliance works. In many cases, it takes only a matter of seconds, but err on the side of leaving the food processor on for the minimal amount of time to avoid chopping the vegetables too finely. Use a rubber spatula and spoon to arrange the vegetables in the food processor so that the entire batch of vegetables is cut up in even sizes. Remove the lid from the food processor. Look at the vegetables to assess whether they are cut up enough. If they need to be cut more finely, place the lid back on the food processor, and turn the food processor on again. Contain checking and turning the food processor back on until the vegetables are cut up to the fineness you prefer. Use a rubber spatula and spoon to remove the vegetables from the food processor after they are cut up to your liking. Wash the food processor parts thoroughly by hand with warm, soapy water. Using a food processor to cut up vegetables can save you time and energy, as compared to cutting vegetables by hand. Cut large quantities of vegetables in your food processor and freeze them so you have them on hand and ready to use at a moment’s notice when you want to cook a recipe. Keep children away from a food processor when it is in operation. Do not touch a food processor in the area of the plug or electrical cord with wet hands. Use caution around the sharp parts of the food processor. Also be careful when using sharp kitchen objects, such as a paring knife.